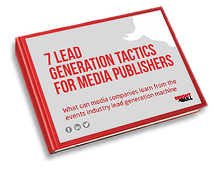 Download the ebook "7 lead generation tactics for media publishers"
What can media companies learn from the events industry lead generation machine? Lead generation for media publishers seems a tricky business at the moment – so why not take the learnings from event industry professionals to optimise this crucial part of your marketing strategy? Your sales team will appreciate it, and you’re likely to see your database size soar. So why wait?